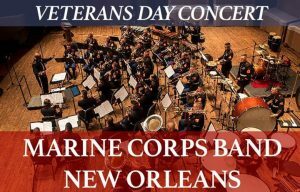 Marine Corps Band – Free Veterans Day Concert! Home/News, Things To Do/Marine Corps Band – Free Veterans Day Concert! Jefferson Performing Arts Society will be hosting the Marine Corp Band for a FREE Veterans Day Concert! Join us November 12 at 4:00 PM at the Jefferson Performing Arts Center to honor the men and women of our military. The Jefferson Performing Arts Center is located at 6400 Airline Drive • Metairie, LA. Bring your family, friends and loved ones for a wonderful concert. Since November 10, 1775 precision and adaptability have been the hallmarks of all Marine Corps units. Marine Corps Band New Orleans is no different. The band is dedicated to excellence and committed to providing America with a glimpse of the Marine Corps’ proficiency and versatility. Marine Corps Band New Orleans was established October 1, 1978. Under the operational control of the Commanding General, Marine Forces Reserve and Marine Forces North, the unit is comprised of active duty Marines stationed aboard the Marine Corps Support Facility in New Orleans, Louisiana. The band supports all units of the Fourth Marine Logistics Group, Fourth Marine Aircraft Wing, Fourth Marine Division, and Force Headquarters Group. Additionally, these Marines are often called upon to perform in support of Marine Corps Recruiting Command initiatives and community relations programs. The band is proud to be located in the historically and culturally significant city of New Orleans. They frequently perform in a variety of local events and, when they travel throughout the country, they take every opportunity to share the spirit of the Big Easy with its audiences.